Guess what? Another fail! Barkley failed to get the minutes on the pitch that I envisioned when selecting him as my FlyBuy pick for GW9. But that is the danger of selecting players returning from injury. Some are thrown straight back into the action, and some are reintroduced selectively to regain their fitness. I have no doubt whatsoever that young Ross will come good once he starts for Everton, and I strongly suspect this will be in GW10 for the home game versus a Swansea side that has another former FlyBuy doing very well at present. Yes, Wilfried Bony continues to be my only winning pick so far this season. What to do, what to do. Pick another player returning from injury? Or maybe just a proven big-hitter struggling with form at present? I've decided to go with the latter, in the hope of not being caught out as usual by a lack of game time resulting in the dreaded one point cameo. It makes my already bad FlyBuy stats look so much worse you see! So it's a former power-player, a proven FPL points magnet if you will, who is struggling for form despite getting game time. To be honest, one man above all others sprang to mind when considering this. And no, it's not Yaya Toure because I picked him in GW5 - and he's still terrible! My mind was made up after verifying his stats were indeed tragic (1 / 4 / 2 / 0 / 3 / 1 / 2 / 1 / 3) despite him racking up significant game time. He exploded onto the scene in 2012/13 racking up 12 goals and 13 assists from midfield, but was rather disappointing last season with only 4 and 8. This season, in the 9 Gameweeks to date he has returned 0 goals and only a solitary assist in GW2. Doesn't make for great reading, and I am not at all confident in this pick, truth be known. However, he faces Burnley - at home - in GW10, so he could make up for lost time. It's then Swansea (A), Man Utd (H), WBA (A) and SOU (H). Not the easiest of fixtures on paper, but he plays for a team whose pre-season ambition every year is to finish 4th, so goals and points are achievable. He is owned by just 1.8% of FPL managers, costs the hefty sum of £8.2m (from a starting price of £8.5m) and there are dozens and dozens of better options than him out there. But what if I'm right? Well, if I am, it is Arsenal man Santi Cazorla you need in your team, because that's my FlyBuy pick for GW10! Let me know if you get drunk enough to transfer him in! For a limited time only get 33% OFF our FPLH shirts (designed by @matejp23) by entering SHIRTSONSALE as the promotional code - CLICK HERE to see the shop! The Maverick is on a roll! So far picks Mane, Hernandez and Last week Frank Lampard delivered the goods for @fplhints as we scour through the gravel at the bottom of the fish tank to get those hidden gems in the treasure chest. Looking at this week’s round of games we turn to West Brom. Much talk has been about Saido Berahino and his impressive haul of points with 6 goals in 8 games for the baggies. Stephane Sessegnon hit a rocket but it’s not quite the turn of the year so his form spell is still to come. The man I’m picking this week is Chris Brunt. A fans favourite who always gives 100%, has gone under the radar so far but recent points hauls befit someone further up the price scale. Three assists in 4 games and in the mix for a set piece he is certainly due a 5 point score in the near future. At 5.4m he offers dependable game time with a team that has somewhat turned a corner over recent weeks and hosting Crystal Palace this week will hold no fears for the Baggies. Only 0.2% of managers have placed their faith in Brunt and those managers over the past weeks have had a good differential on their hands and over the next few games could see his stock rise further as he turns more heads with his performances. Opponents Crystal Palace sit just two places and one point above the drop zone and off the back of two defeats will not fancy their trip to the Hawthorns. WBA did drop late points against Manchester United and 3 points to Liverpool but a 4-0 win against Burnley and a 1-0 triumph over Spurs will give WBA great confidence that they can come away with the spoils. Did you pick Lampard last week? Not sure who to transfer in this week? Can the maverick solve your problems? The Belgium international has returned to action with 2 appearances in this 2014/15 Premier League season and the 23-year-old's return is a much needed boost for Aston Villa given that the Midlands club have not won a Premier League match since beating Liverpool (0-1) at Anfield in September. Villa have not won any of their last 4 Premier League matches, scored a goal or even picked up a single point during that run but after facing 4 of last season's top 5 in that run, the fixtures appear to be getting better for Paul Lambert's men and presents Benteke with a chance to shine. His last Premier League goal came v Stoke City (1-4) in March last season. His first Premier League goal came v Swansea (2-0) in September 2012. A considerable amount of Benteke's Premier League goals have came away from home. Benteke scored 4 goals in his first 4 starts in the Premier League last season. Benteke scored 3 goals in his last 4 Premier League starts. Benteke was the last player to score a hat-trick in a Premier League Monday night match on April 29th 2013 against Sunderland (6-1). Given Benteke's great phsyical presence, the former Genk man can told the ball up well, bring others into play and pop up with the odd assist. Aston Villa's next three opponents QPR, Spurs & West Ham have conceded 18, 11 & 11 goals in the Premier League this season respectively and kept just 3 clean sheets in the Premier League between them since September. Stats are self-compiled, mostly from memory, however some are found/self-compiled/double checked through the use of FourFourTwo Stats Zone & BBC Football. Football Blogging Awards 2014 - Finalists yet again! VOTE @FOOTBALLFANCAST as the Best #ESTABLISHED BLOG! VOTE @GALLOWGATESHOTS as the Best #CLUB BLOG! VOTE @STEPHNUFC as the BEST #FEMALE BLOG! It should come as no surprise to regular readers that my FlyBuy pick for GW8 flopped. However, I do still believe Lallana will come good in the coming weeks and he is definitely still one to bear in mind as a differential. Of recent FlyBuy picks, only Wilfried Bony is justifying his selection. After a poor return in GW6, he has gone on to score in consecutive games and is starting to look very strong. For this week's pick, I was deliberating between two players returning from injury who made their long awaited comebacks last week. Both got good minutes on the pitch, with one returning a useful assist. Both have favourable fixtures coming up and it is a difficult decision to select one or the other. One is a midfielder and the other is a striker. With competition for the three Fwd positions becoming increasingly tough due to a number of players in good form I have decided not to go with Aston Villa's Christian Benteke. At £7.9m he is in the same price range as Graziano Pelle, and although the big Belgian has a differential-busting ownership stat of 0.3%, I can't see too many people taking a chance on him just yet. Maybe in a few weeks with a couple of goals under his belt he could be the man to swap Pelle out with once Southampton's fixtures get harder from GW13 onwards. Coincidentally, Villa then enter a run of favourable fixtures so keep this in mind when planning future transfers. But, back to the matter in hand, I am NOT tipping Benteke for FlyBuy this week. So who is it? As I said he provided an assist in his return last weekend and he currently has a very useful ownership percentage of just 3.4%, making him an attractive option for a player with proven FPL points pedigree. With his club also entering a good run of winnable fixtures, and with managers trying desperately to free up funds to squeeze Aguero into their team alongside Costa and Pelle, they will probably need to lose one of their premium midfielders. At £6.7m, this is probably the cheapest price he will be this season, so I recommend you climb on board sooner rather than later. The player in question, of course, is Everton playmaker Ross Barkley. I'm currently trying to find a way of squeezing him into my team, the tough call is just who to downgrade from Fabregas, Sterling or Di Maria. Good luck in GW9 and thanks for reading. As the dust is blown off the keyboard we pick through the casualties of a hectic couple of international weeks for our premier league players (barring Raheem Sterling of course). The long miles travelled and the inevitable crocks follow and that’s when the chance for a maverick opens up and gives us something to look at from the corner of our eye. This weeks pick is Manchester City’s Frank Lampard. As Yaya Toure returned late from international duty and Fernandinho recovering from a hamstring injury Lampard should be given the opportunity to partner the midfield with Fernando and thus will surely be afforded a few runs in to the spurs box. Spurs have at very best been kind to Manchester City having shipped 22 goals in the last 4 games and under a bit of pressure to perform, they need a dogged performance at very least to appease the fans who once again are becoming a bit restless and another trouncing at the Etihad won’t be welcomed. Back to Lampard and his game time as many predicted has been restricted but when he has appeared he’s proved a very useful asset. Having only featured for 112 minutes over the last 4 games all season has returned 2 goals and 13 points which is a decent start by anyone’s reckoning. At 5.4m there will be a few managers harbouring bench fodder players with transfers to burn that may fancy a risk. Lets’ be Frank, he’s been quality over the years and give him a chance and he knows where the goal is. Some players have a knack of being a thorn in the side of some teams, like how Kevin Nolan likes playing and scoring against Aston Villa and Steven Gerrard likes doing likewise against Newcastle United, Edin Dzeko boasts an impressive record against Tottenham Hotspur as can be seen in the following section. Dzeko posses good movement, strength, good height and presence. The Bosnian sometimes gains from other players deflecting attention from him and ultimately making space for him to strike. Some players really prove to be a are a thorn in some team's side and it seems to be that way in the case of Edin Dzeko against Tottenham Hotspur. The Bosnian international scored in midweek for his country and although he is streaky in terms of finding the back of the net, there is no doubting that the former Wolfsberg man knows where the back of the net is. Dzeko has scored no fewer than 6 goals against Spurs since the 2011/12 season. Dzeko did not feature in Manchester City's home win against Spurs last season (6-0). Dzeko scored 4 goals in one game away at White Hart Lane against Spurs in the 2011/12 season. Dzeko has been involved in a goal (scored/assisted) in only 3 Premier League goals thus far this season. Dzeko is looking to score his first Premier League goal at home since scoring against Aston Villa (4-0) in May. 5 of Dzeko's 6 Premier League goals against the London club came at White Hart Lane. Dzeko has scored the exact amount of Premier League goals this season (2) as he had done at this point last season (2). The majority of Dzeko's Premier League goals last season came from late December onwards. Dzeko is an enigma but on his day is one of the most clincal strikers in the Premier League, the difficulity for FPL managers is finding those right days and as much as talk of tactics or form, it is genuinely very hard to know when the Bosnian will strike. Dzeko can be somewhat hot and cold in terms of when he scores but if you are a FPL manager with a spare transfer or two, some money in the bank to replace someone who is not quite at the races, seemingly out of favour or injured, then Dzeko could well be your man. Stats are self-compliled, mostly from memory, however, some are checked or found through FourFourTwo Stats Zone and BBC Football. My word that's been a long two weeks! International breaks really do interfere with the world of FPL. I'm not a fan! But at least it's given me the opportunity to reflect on the first 7 gameweeks. From a personal point of view its been pretty good. In the Top 21k and with only one red arrow so far. The decision to captain Ulloa over Di Maria in GW 7 is one that cost dearly but hey-ho. The other thing that has been a disappointment are my FlyBuy picks to date. A mixture of bad luck and poor choices have combined to ensure NOBODY is taking any notice of my picks anymore! My choice for GW8 does err on the side of caution, and admittedly he did score last time out. But I believe he has the potential to go nuclear over the next few gameweeks, and for that reason I'm selecting him. A decision to captain him late last season cost me horrifically when he failed to deliver, but I hold no grudges. This week he faces everybody's favourite whipping boys, QPR, and I expect him to accumulate some points. Maybe he is regretting the decision to move in the Summer, especially with his old club riding high in the table. Hopefully he will use that as an incentive to push himself harder and score the goals to propel his new team up the league. Yep, this week's FlyBuy is Liverpool and England midfielder, Adam Lallana. Pricey at £8.4m, but if you want to get away from the Template team, an astonishing fact is that he is owned by just 0.8% of FPL managers! An uber-differential!! For a limited time only get 15% OFF our FPLH shirts (designed by @matejp23) by entering PREHALLOWEEN as the promotional code - CLICK HERE to see the shop! The former Southampton man is gradually getting closer to fitness and perhaps the International break sees an opportunity for FPL managers to think ahead about their up and coming transfers. Walcott could just be one of those to mull over in the coming weeks, although it remains to be seen when exactly when he will be available for selection or be able to start or have a full 90 minutes. However, in the meantime, here is what the Arsenal number 14 is capable of when he is firing on all cylinders. Walcott was one of only 4 players to reach double figures in goals and assists in the Premier League in 2012/13. Walcott scored 5 Premier League goals from December to January last season before being sidelined for the rest of the season and being ruled out of the 2014 World Cup. Please note that Theo Walcott has not played a Premier League match since January 1st 2014 or a competitive match since January 4th 2014 (FA Cup) therefore is more than likely to need match fitness. After last gameweeks’ opening success story of Southamptons Sadio Mane we continue the hunt for Fantasy Premier League points in the low ownership saloon with another deadline day signing from a team eagerly trying to push on into the top third of the league. Hull have somewhat in my opinion pulled off a major coup in signing this player, and I think he could propel them with his goals easily into the top half of the league. It’s the Uruguayan forward Abel Hernandez. Kept out of his international side by the likes of Luis Suarez, Edison Cavani and Diego Forlan, Hernandez still has 16 caps to his name and has 8 goals for his country means he has the ability to produce at the highest level. Spending the last 4 years of his career at Palermo, Abel produced 31 goals in 111 appearances but his last season proved his best return for goals where he achieved a 1 in 2 ratio with 14 goals in 28 starts along with 2 appearances off the bench. A successful world cup and a 10m move to the KC followed with immediate impact scoring a cracker against West ham on his home debut. 55 minutes against Newcastle in his second match and a 1 point showing made some managers jump ship but those who kept the faith in Hernandez were rewarded with another goal against the champions Manchester City albeit via the penalty spot. This however bodes well for the future if the Uruguayan is assigned spot kick duties from now on. Hernandez’s inability to complete 90 minutes so far will scare off some with only 73, 55 and 78 minutes completed in his 3 starts thus far coupled with the fact that Ulloa and Pelle are strong contenders for the third striking spot and also in good form. The maverick is all about being different and with an ownership of 0.3% per cent that equates to around 6,800 managers having the faith in Hernandez and a nice home fixture against Crystal Palace he has the perfect platform to justify the price tag and bag himself plenty of FPL points. Priced at 6.9m he’s not a cheap third striking option if you already own the likes of Costa and Aguero but if you are only playing one big hitter and two smaller options then he definitely could slot straight in. Hull rotate fixtures with Burnley so there may not be an obvious foil for him but Swansea only clash on a few fixtures so Gylfi Sigurdsson could provide his near perfect rotation partner. The fixtures ahead over the next six are a bit of a mixed bag, Home against Palace tomorrow followed by trips to the Emirates and Anfield aren’t the most desired trips but certainly won’t scare the tigers who could at least nick a goal, then saints at the KC then a trip to Turf moor brings a greater chance of returns and a home game with Spurs to round off the next six games. So there is this weeks’ gamble, are you looking to replace Rooney? Abel Hernandez may not have been at the top of your thoughts but it’s all about doing something different to climb those leagues, are you Abel? And so my dismal record continues! To be honest it'd be a miracle if any of my FlyBuy picks ever provide a decent FPL points return ever again! When you look at the Stats and see that my GW1 pick of Calum Chambers is the top scorer with 8 points in GW3, you get an idea for how badly I am doing. Last week's pick was Swansea man Wilfried Bony, who after his red card in GW5 was only trusted for an 18 minute cameo providing a solitary point. But you can't deter me. I will keep looking, and keep picking. I hope you all remember that the selection criteria for a FlyBuy pick is a player who HASN'T been doing particularly well for one reason or another (poor form or maybe a return from injury). Hence why I can't go and pick someone like Pelle or Chadli for instance. Also, it's not just a one week pick, it's a selection based on the possibility of them going on a run over approximately 5 weeks. This week's pick comes from a team whose players have been generating a lot of interest on Twitter this week. Rather unusually, this interest comes from West Ham. I know, I know, everyone has been on the crazy pills, but it shouldn't be ignored that their next couple of fixtures are against QPR (H) and Burnley (A) respectively. Downing and Sakho in particular are the names I am seeing cropping up regularly as transfer targets for some managers this week. But I think the REAL potential points gatherer lies elsewhere in that team. Greetings fellow Fantasy Premier League managers! I’m Dean, and I’ve launched a new FPL management tool - asliga.com – that provides you with stats, graphics and tips to help you get the most out of your FPL team. The good folks here at Fantasy Premier League Hints have allowed me to contribute a guest post for your reading pleasure, and hopefully it will become a regular occurrence. I thought for our first article I’d show you 5 things we've discovered by browsing players on Asliga this week that will hopefully help you with your upcoming management decisions. On Asliga you can click on any player’s name, anywhere on the site and discover you have a whole range of in-depth player information right at your fingertips. We have broken it all the statistics down into home and away which can provide interesting insights. Ulloa has exploded out of the gates this season, scoring 5 goals and returning the second most fantasy points with 38. His low price point has been attractive to fantasy managers, which has seen his ownership rise over recent weeks to 18.1% and his price increase to 5.9m. However, whilst browsing though his statistics, we've noticed Ulloa doesn't seem to be pulling the trigger away from home. The Argentine forward has only taken a measly 2 shots on the road, against 10 at home in as many games. Interestingly enough, his shooting accuracy is 50% both home and away, but with few chances seemingly falling his way outside the King Power stadium, you might want to sit him on your bench for away games. On the flip side, one man who has been a stalwart of many FPL teams over the last few years, David Silva, seems to be much more effective in his travels than is his own backyard. 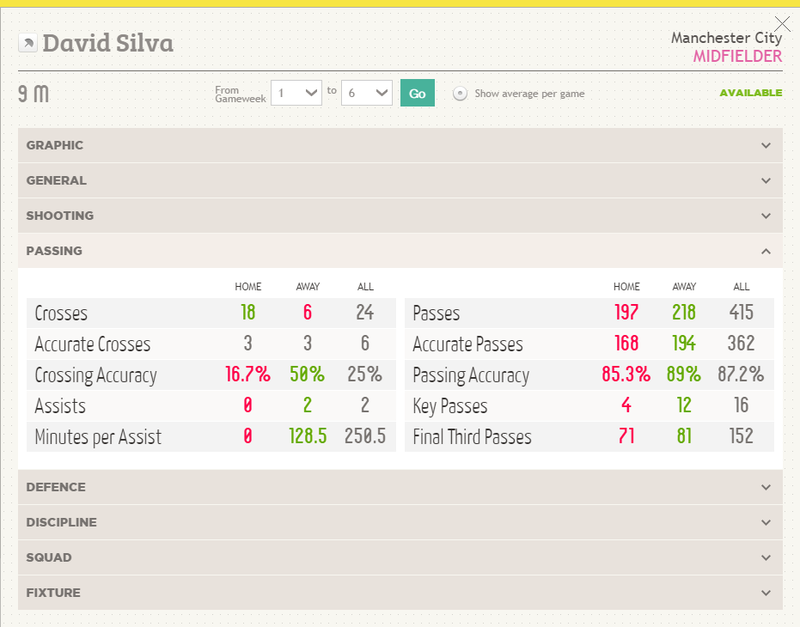 Silva has thus far contributed 1 goal and 2 assists to Manchester City’s title defence, and all of them have come away from home. 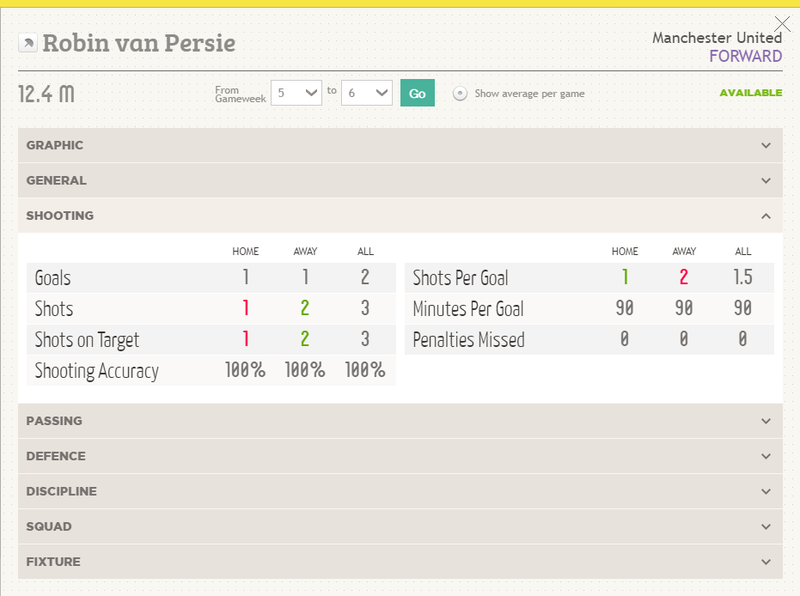 He has taken 4 shots away compared to 1 at home, and provided 12 key passes away compared to 4 at home. He has had roughly the same amount of passes in the final third home and away, so this would suggest he is just finding it easier to pick a pass or make space for a shot away from the Etihad. With Aston Villa, West Ham and QPR all away in the next 5 games Silva might be one to watch, especially if you need to replace the injured Ramsey. When Falcao arrived at Old Trafford, everyone was wondering whom van Gaal was going to drop to make room for the Columbian. The former Arsenal striker was struggling for form, and having drawn blanks is his first three appearances many believed it would be RVP who would be the one to take a place on the bench. Whether van Persie just needed a few games to get going, or was simply galvanized by the threat of Falcao I couldn’t tell you, but the Dutchman has now scored in his last two outings and is sporting a 100% shooting accuracy. Granted, he has only had three attempts at goal, but if you’re going to hit the target every time and score every 1.5 shots, you don’t need that many chances. RVP’s price tag is a hurdle most managers will not be able to get past, but with Manchester United’s defensive woes, they will need to outscore their opponents to have a chance of getting any results. No doubt van Persie is hungry for goals. As a Chelsea fan, I’ve always had a soft spot for the big Belgian. It seemed like such a fairy tail when he arrived at Chelsea – He was playing with his idol, Didier Drogba, at his dream club. However, it never really worked out for Lukaku and he has now found a new home on Merseyside. Like van Persie, Lukaku also failed to hit the back of the net in his first three games, which frustrated managers all over who counted on the Everton forward bag a goal or two, despite the fact he faced the likes of Chelsea and Arsenal. 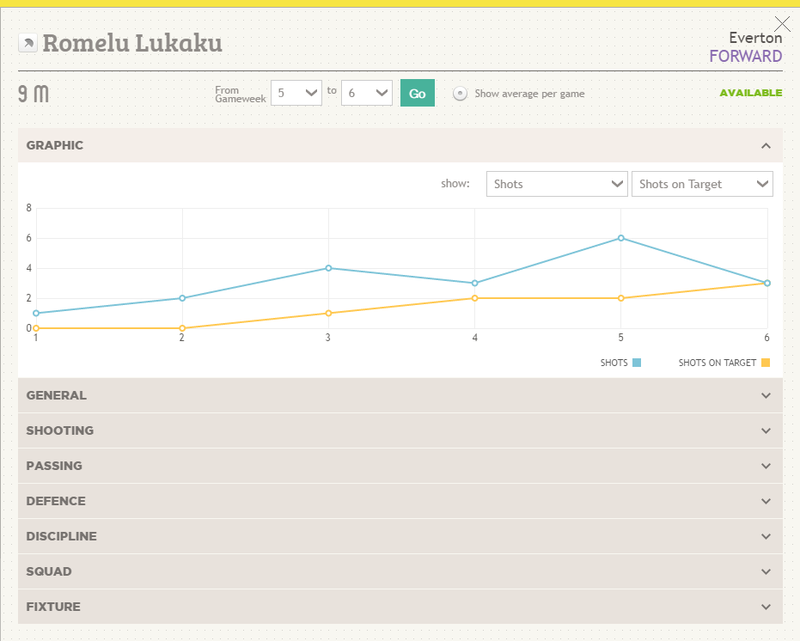 However, Lukaku has now scored two goals in his last three games, and if you look at the graphic provided you can see that his shooting is improving most every week. His shots on target are becoming more and more frequent, and whilst he had fewer chances last week, he boasted his first 100% shooting accuracy match of the season. If Wayne Rooney left you with a big red hole in your front three, you might want to take a sneaky look at the Belgian forward who is facing a Red Devils side this weekend with all sorts of defensive problems. It may be a bit too soon to panic, but the Spanish midfield maestro has drawn a blank in his last two gameweeks. 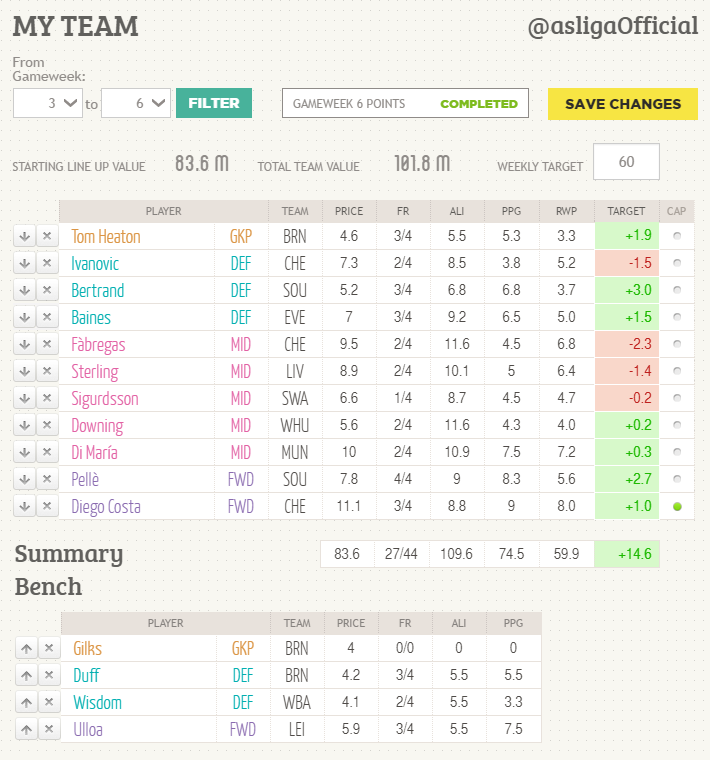 One of Asliga’s features is a tool that allows you to import your FPL team to experiment with your line up and see if each player is scoring enough points to justify their price and place in your squad. We do this by allowing you to set a weekly points target, and then calculate how much each player needs to score weighted by their market value. As you can see in the image, our target is 60 points per gameweek and over the last four gameweeks Fabregas has provided on average 2.3 points below his required target of 6.8. As Chelsea proved last week, any player in their embarrassment of midfield riches can step up and supply the cutting edge needed to tear apart Premier League defences, with Willian and Oscar stealing the show. Fabregas has still provided the most key passes in the whole league with 20, so there is no shortage of scoring opportunities, but if it comes to pass that Fabs relaxes into the pack and shares the fantasy spoils with his team mates, we may need to assess if his price and his points return equate to money well spent. So that’s it for now! If this was helpful, feel free to sign up to Asliga to see how we can help you improve your own FPL team. We have two pricing options, 15 pounds for a season pass or a monthly subscription for 3 pounds per month – which is peanuts if you just want to try it out for a few weeks. You can take a sneak peak by viewing our trailer here. Follow us on Twitter @asligaOfficial and let us know what you think!